Kee Safety Step-Overs provide a safe route over objects and obstructions on the rooftop. Accommodates metal profile, standing seam and other roof styles without penetrating the roof membrane. Safe Access Platforms are custom built solutions that meet the specific requirements of your rooftop surface and provide a safe route over pipework, HVAC and other rooftop obstructions. All Kee Safety platforms are engineered to meet OSHA safety standards and designed for maximum durability. Every rooftop is different. Shape and surface transitions require a step-over system that securely maneuvers changes in level and height. Safe Access Platforms exceed the capabilities of other customized, fabricated, off-the-shelf platforms. Each Safe Access Platform is specifically designed to suit your unique applications and criteria. Utilizing modular components allows us to design secure structures that are reliable, flexible and support your critical safety needs. With minimal on-site disruption, that makes installation easy. Using Crossovers may provide a safe and efficient path across the rooftop than was previously possible. Optimum fall protection requires seamless integration with products that are engineered to save lives. 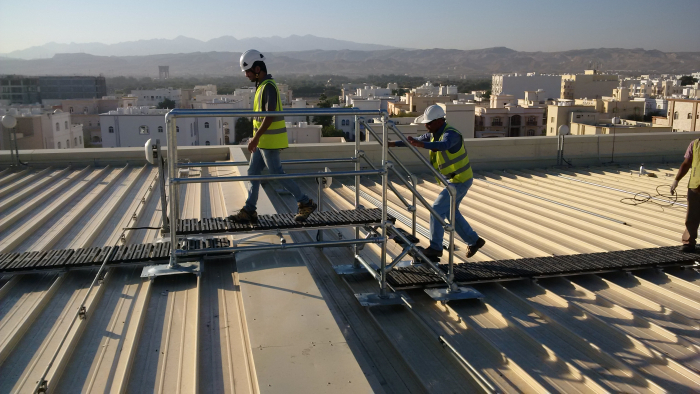 Safe Access Platforms work with Kee Walk, KeeLine and Kee Guard fall protection systems to establish a secure and dependable work space on the roof. All Kee Safety custom-designed platforms are delivered with detailed drawings clearly showing how the platform is assembled for the highest level of safety. The full range of components, railing, stair treads, flooring and toe boards are in-stock for fast delivery. Smaller platforms can be delivered fully assembled and will only require a routine inspection before use. Larger platforms can be delivered semi-assembled in modular sections or as components in a flat pack container. Kee Safety professional installers will assemble the platform in position on the roof site for you.